MIAMI, FL--(Marketwired - October 01, 2015) - Badia Spices is once again commemorating Breast Cancer Awareness Month by teaming up with National Breast Cancer Foundation, Inc.® (NBCF). The partnership is designed to help broaden awareness for breast cancer while raising funds to support NBCF's mission to help women now by providing help and inspiring hope to those affected by breast cancer through early detection, education and support services. NBCF is one of the most recognized and respected breast cancer charities in the nation. Since 2003, NBCF has received the highest 4-star rating by Charity Navigator, America's premier charity evaluator. Each year, over 80% of their revenue is directed to their life-saving programs, and because of that, NBCF has grown. For over 30 years, Badia Spices has brought to market the finest ingredients from all corners of the world; Badia is committed to offering their consumers the highest quality, at the best prices. In just four years, with the help of its consumers, Badia Spices has raised $450,000 to benefit NBCF. This year Badia Spices' crusade to help NBCF will begin with National Breast Cancer Awareness Month in October 2015 and continue through October 2016. NBCF's logo will appear on all 3 oz. 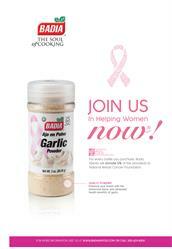 Garlic Powder packaging and Badia Spices will donate 5% of all global sales to NBCF. "Thanks to partners like Badia Spices, the message of early detection of breast cancer and the importance of personalized medicine is reaching across the globe," says Janelle Hail, NBCF Co-Founder & CEO. "The funds they raise help us provide thousands of free early detection and navigation services in all 50 states, and they ensure that breast cancer patients outside the U.S. have access to information about personalized treatment." "As a global company that exports product to more than 70 countries, Badia Spices is part of a diverse community and we are proud to support the prosperity of the communities where we live, work and play. We appreciate our consumers' charitable involvement and look forward to once again giving back to NBCF through this national partnership," said Joseph "Pepe" Badia, President, Badia Spices. Recognized as one of the leading breast cancer organizations in the world, NBCF's mission is to help women now by providing help and inspiring hope to those affected by breast cancer through early detection, education and support services. A recipient of Charity Navigator's highest 4-star rating for eleven years, NBCF provides women Help for Today…Hope for Tomorrow® through its National Mammography Program, Beyond The Shock®, Early Detection Plan, and breast cancer research programs. For more information, please visit www.nbcf.org. Established in 1967 by Jose Badia, Badia Spices is the world's leading privately Hispanic-owned spice manufacturer with 2014 sales totaling over $120 million. Badia Spices has brought to market the finest ingredients from all corners of the world, making it a favorite among all types of cooks. More than 350 different products are prepared, packaged and shipped to 70 countries and the entire United States. In addition Badia Spices is committed to offering their consumers the highest quality, at the best price. Badia Spices has added an Organic and Gluten-Free line, and is proud to have its products certified by Safe Quality Foods, an audit recognized around the world as being one of the most rigorous and credible food safety management systems in the marketplace today. For more information, visit the Badia Spice's web site at badiaspices.com. About this company Badia Spices, Inc.
Badia Spices has once again partnered with National Breast Cancer Foundation! 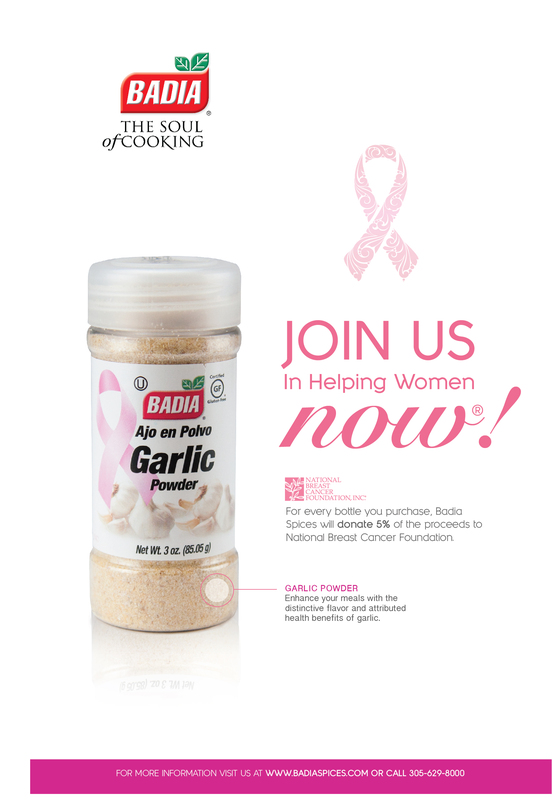 Anytime you purchase a 3oz bottle of our Garlic Powder anywhere in the world, Badia Spices will donate 5% of the proceeds from that sale, we are ‪#‎HelpingWomenNow‬!